Move in ready home in one of our most desired communities of Ridge Haven of Brevard, North Carolina. This lovely home offers winter and year round views with excellent outdoor living spaces located in a cool elevation backing up to a natures paradise. You will love the large, light and bright rooms which include four bedrooms plus two multi use rooms. The open kitchen offers a breakfast nook and opens to a formal dining room to the den. 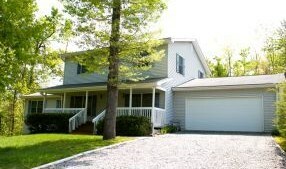 This home also includes a spacious laundry room, double garage and workshop plus a generator for power outages. You will enjoy the garden area of this beautiful mountain home and the convenient location; under 12 miles to Brevard and just minutes to Gorges State Park. Ridge Haven's residential community is part of the story of God’s grace and His unique provision of Ridge Haven itself. The beauty of the spacious, hardwood-covered lots is surpassed only by the special people the Lord is building into a one-of-a-kind community. The quiet and four-seasons beauty of the Ridge Haven subdivisions is accompanied by Ridge Haven amenities, services, and spiritual blessings surpassing many exclusive clubs and residential developments. Most of all, lots in the Ridge Haven community provide some of the most affordable land to be found anywhere in the mountains of Transylvania County.